Things are still ramping up after the holiday slump in the world of game crowdfunding, so the TFC team has taken this relatively quiet period as an opportunity to look back at a few notable projects that were funded in 2014 and see what they are up to now. 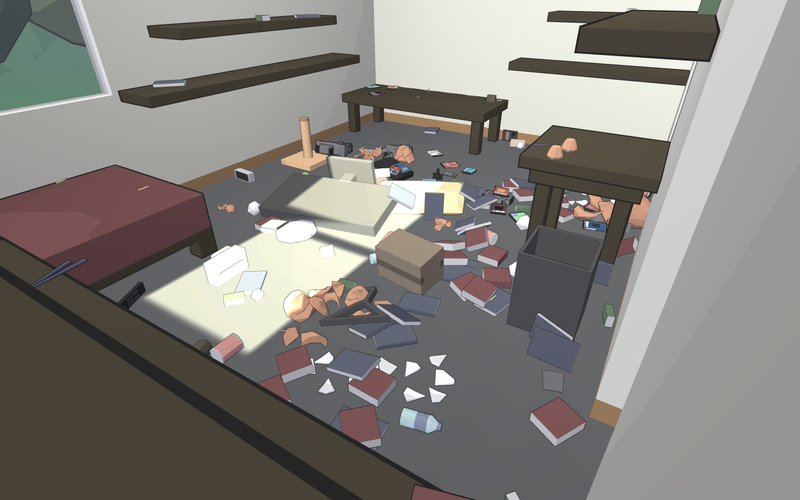 The Catlateral Damage Kickstarter campaign took place between mid-June till mid-July 2014, hit its goal in little over a week, and went further as to reach a 150% funding mark, including a couple of stretch goals in the process. Now, cats being the central element of the game and this being the internet, it seems like anybody could have predicted its triumph. That's probably true, but nonetheless a remarkable part of Catlateral Damage's success must be found in how creator Chris Chung managed the pre-campaign. Indeed, this TFC member found out about it just one year ago thanks to an imgur post, downloaded the build available back then, and loved the hell out of it. Later on some Youtube gaming personalities featured it on their respective channels, and by then the game had already pretty much raised enough awareness as to try the crowdfunding assault. So here's a useful tip for anyone who's considering crowdfunding as a way to finance their games, even if they have nothing to do with cats: spread the word waaaaay before launching your campaign! In that regard a playable demo can do wonders, so consider delaying the start of the campaign if you feel you can produce something playable in the immediate future. Unless you're an already renowned developer, chances are people won't be that keen to give you their money if you don't have much to show them in the first place. Currently the game is in Early Access on Steam for those who backed the game (either during the Kickstarter or later as slacker backers) at the $20 level or above. It's getting updates on a slightly monthly basis and, unless there are unexpected delays, it's expected to be released at the end of March, so get prepared to be in a cat's shoes very soon! With the intitial hype of Kickstarter long dead, last year proved that it's still possible to make a big splash on the funding platform for a no-name indie with a niche game concept. Some of the most memorable campaigns included Dog Mendonça & Pizzaboy, HM Spiffing, and Kelvin and the Infamous Machine, which all included demos to prove their concept, and whose creators had obviously put a ton of work into planning ahead of launching their campaigns. The one campaign that really stood out to this TFC member though, was the Jenny LeClue campaign. With almost daily updates, funding challenges and giveaways throughout the campaign, the creators made an impressive display of how to stave off the worst of the dreaded midway lull. They also managed to reach and excite several key people through social media, got write-ups by some of the bigger gaming news sites and for a while it seemed like it was all everyone was talking about. Backing it felt like being on a massive hype train that didn't show signs of stopping until they busted through $100k and beyond at the end; well past their original $65K goal. Jenny LeClue, ready to solve the case. 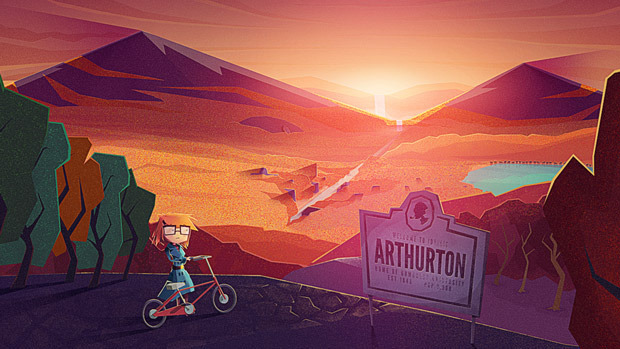 Jenny LeClue was funded in August last year and is still deep in development. If you want to keep up to date on progress, the game's official website has links to their Tumblr page (where they regularly post art updates), their Twitter and Facebook accounts, and an email newsletter you can subscribe to for monthly updates. The Frogdice team actually ran one and a half campaigns for Stash: No Loot Left Behind -- the first campaign being cut short in order to drop the funding goal in half thanks to matching funds. The back-to-back funding attempts were rather gruelling, but the persistence was rewarded by a successful second campaign that crossed the line thanks to hard-core support from the Frogdice fanbase -- 837 backers with an average pledge of $62 is impressively high for a free-to-play game, don't you think? No matter how unique the combination of game mechanics are in Stash (an MMO with turn-based RPG play, crafting mini-games, and extensive home-base customizations), it has to be a hard sell to get someone to pay for what they could have for free by waiting a little longer! The only reason the Stash campaign succeeded was because of Frogdice's dedication to building a community and keeping it happy. The Frogdice emphasis on community building is obvious from the start, with their leader frequently hanging out with backers in Kickstarter threads, and includes heavy developer participation in both forums and a love of running in-game events for their online offerings. Their user-friendly orientation has led Frogdice to adopt very conservative funding practices that avoid impatience and disappointment as much as possible, by self-funding as much as possible and being very cautious not to allow scope creep to push forward their deadlines. Happily their last few games have supported Linux, with full participation in betas and simultaneous release just like we all wish for, so some of us penguin-lovers have joined the ranks of satisfied Frogdice customers who are willing to invest in their upcoming games. 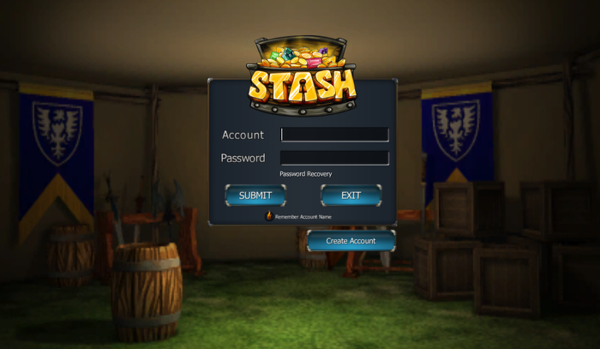 Welcome to the world of Stash, adventurer. Frogdice almost always hits their schedule milestones promised in campaigns (see conservative approach mentioned above), but this time around the first major milestone was a bit late. Just goes to show that even a great planner can't plan for everything -- the planned Alpha #1 test event was delayed by their lead developer having rather spotty access to their servers, thanks to an unplanned sailing trip across the Atlantic. The good news is that Stash Alpha #1 started January 23 and is in progress until Monday Feb 2, allowing some of those dedicated fans an early peek so they can watch the game evolve through release. Per the usual Frogdice practices, the Linux client was on par with the other platforms with full participation in the alpha. Those who really dig that sort of inside peek, watching Stash progress through alphas and betas to official release, are still welcome to join the loyal Stash community with a $50 investment. There it is. These examples were only a sample of the many projects that succeeded in 2014 and are coming our way during 2015. And onwards indeed we must look, not only at what's under development, but also at the new interesting proposals that are already knocking on our virtual doors looking for some love (and funds!). So expect us back soon with our first 2015 picks! Please PM one of the team: (scaine, Speedster, muntdefems, flesk, or DrMcCoy) if you think you can help or just want to chat about Crowdfunding! And of course, remember that you can use the comments, Wiki, forums, or direct messages (PMs) to keep us up updated on any suggestions that you'd like to see covered. It's become such an embarrassment of riches that I have actually become picky about what I buy! Yes, the StarCrawlers beta is looking so promising! Wow! That is a wonderful write up about Stash! Thank you so much. I definitely hope more folks will check us out. We already have the beginnings of a spectacular community. Thanks for sharing these! I never really liked Wild West stories/movies (my parents watched too many when I was a kid...), but there's something about Hard West I'm really looking forward to.